International Journal of Research in Health Sciences,2015,3,3,423-428. 1,2,4-Assistant Professor, 3-Associate Professor, 5-Professor and HOD, Department of Medicine, Pt J N M Medical College, Raipur and Dr BRAM Hospital, Raipur (CG), INDIA. Background: ACQUIRED IMMUNODEFICIENCY SYNDROME (AIDS) has killed more than 25 million people since it was first recognized in 1981, making it one of the most destructive epidemics in recorded history. It is estimated that 90% 0f HIV infected live in developing countries with Indian estimate of a 5.7 million. Overall average prevalence rate of HIV among adults in India is about .9% and it accounts for 10% of HIV burden and 65% of that in south and south-east Asia. Oropharyngeal and gastrointestinal diseases are common features of HIV infection. They are most frequently due to secondary infections. Gastrointestinal manifestations of HIV disease include chronic diarrhea, dysphagia and odynophagia, nausea vomiting, weight loss, abdominal pain, anorectal disease, jaundice, hepatomegaly, gastrointestinal bleeding and GI tumors. Materials and Methods: The present study was conducted in the Department of Medicine, Pt J. N. M. Medical College, and Dr BRAM Hospital Raipur (C.G.) from April 2011 to Dec. 2012. 30 HIV positive /AIDS patients of different age groups including 22 males and 8 females were included in the study attending outdoor or admitted in wards of Department of Medicine, in Dr. BRAM Hospital, Raipur. Diagnosis of HIV was done by rapid spot test reported reactive by VCTC, center in Department Of Microbiology of the institute. Results: In the study among 30 cases, 22 (73.3%) were males and 8 (26.7%) were females. Maximum number of patients 25 (83.3%) were in the age group of 21-40 of years. Most common mode of transmission was heterosexual in 24(80%) of patients. 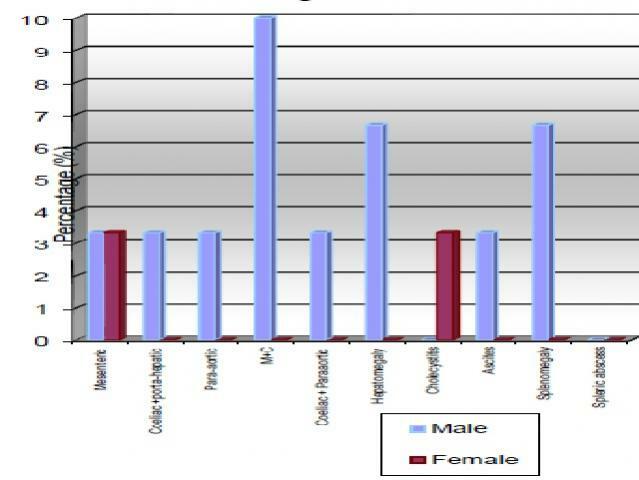 Ten (33.33%) males and 2 (6.67%) females had history of tuberculosis, 4 (13.33%) males 1 (3.33%) females had genital uler and 3 (10%) males and 1 (3.33%) females had history of blood transfusion. In the oesophageal symptoms retrosternal chest pain was present in 36.67% and odynophagia in 30%. Diarrhea was present in 43.33%, vomittng in 26.67%, nausea Tuberculosis was the most common past illness in 13.33% and abdominal pain in 20%. Oral thrush was present in 46.66% patients and aphthous ulcers were found in 13.33%. Lymphadenopathy was present in 20% patients predominantly involving cervical lymph nodes. USG abdomen showed lymphadenopathy as predominant finding present in 26.67% patients involving mesenteric and coeliac lymph nodes in 10%. In Upper GI Endoscopy oesophageal candidiasis was the most common finding present in 33.33% patients followed by oesophagitis in 14.28%. Conclusion: Gastrointestinal manifestations are very common and responsible for high morbidity in HIV patients involving whole of the GI tract. Oral thrush is a common in patients with HIV. Oesophageal candidiasis is common in patients with HIV presented with anorexia and odynophagia. Chronic diarrhea is very common and etiology is difficult to identify and responsible for significant morbidity and mortality.